Redemptorist Father Theodore (Ted) Heyburn, known for his outstanding preaching and gift for making lifelong friends, died November 12, with his brother Frank and a number of his confreres praying at his bedside. The 77-year-old Brooklyn native was a member of the community at St. John Neumann Residence in Timonium, MD. He had suffered for many years with complications of diabetes. Father Heyburn was born March 11, 1933, to Nicholas and Frieda Laudenschlager Heyburn and was drawn to the priesthood from the time of his childhood in Our Lady of Perpetual Help Parish in Brooklyn. Like so many Redemptorists before him, he followed the path of studying at St. Mary’s Seminary in North East, PA, and making his novitiate at Ilchester, MD. He made his first profession of vows in 1955 and his final profession in 1958. He continued his studies for the priesthood at Mount St. Alphonsus Seminary in Esopus, NY, where he was ordained on June 19, 1960. Father Heyburn put the same vitality and verve into his mission preaching, Father McGarrity said. Being so much on the road, in often icy and dangerous conditions, could be daunting for a man determined to arrive with a smile and a fresh proclamation of the Good News. But Father Heyburn would recount his mission journeys to Father McGarrity in such a joyful way that the latter, then assigned to parish work, would be almost envious of the blessings of mission preaching, he explained. In 1972, Father Heyburn was presented with another challenging assignment: pastor of St. James Church in Baltimore, one of the poorest parishes in the city, where the African-American parishioners had suffered through the oppressions of the Jim Crow laws and the racial tensions that erupted with the 1969 assassination of Dr. Martin Luther King, Jr., and continued in subsequent years. The match made by the Redemptorist superiors between the parishioners of St. James Church and Father Heyburn proved a happy one for both parties. For his Baltimore community, Father Heyburn, “already a fine preacher,” according to Father Larry Lover, “picked up a style of preaching that made everything come alive.” For their part, the parishioners gave “the singing priest” something he always wanted: a congregation that sang out the words of every hymn. Together, priest and people had joyous celebrations. “He loved it there and they loved him too,” said Father Brendan Greany. In 1978 to 1985, Father Heyburn was an assistant pastor at St. Mary’s in Annapolis. Father Lover, who was stationed there in 1981-83, recalled: “He was the minister of the house and very active in the parish.” One of his activities was working with the parish Right to Life group. Not forgetting his friends from St. James, he would arrange a bus to pick them up in Baltimore to bring them to St. Mary’s, where the right-to-lifers would share a potluck meal and go together to make their views heard at the Maryland House of Delegates and State Senate. 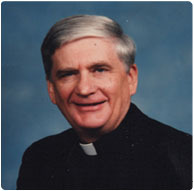 Father Heyburn was named assistant pastor of Our Lady of Perpetual Help Parish in Edgewater, MD, in 1985, where he remained for six years with Father John Travers. He then succeeded him as rector for two terms. In 1996, Father Heyburn was sent, along with Father Greany, to St. Christopher Church, Kent Island (part of Chester, MD). They served there until 1999, when the Redemptorists turned over the parish to the Diocese of Wilmington. Father Greany observed that his confrere had a great gift of making close friendships with everyone with whom he ministered. When Father Heyburn returned to St. Mary’s, Father Denis Sweeney was pastor and found him to be “a gentle, fun-loving priest, very big on celebrations and with a good sense of humor, kind and caring.” Father Sweeney added that Father Heyburn not only put a great deal of thought and effort into celebrating Church feasts, but in celebrating civic holidays as well. Memorial Day Mass would feature a large number of flags, a bagpiper to lead the procession, family memorabilia on display and a bugler to sound “Taps,” Father McGarrity said. In Annapolis, home of the U.S. Naval Academy, the people were greatly responsive, he added. Father Heyburn is survived by his brother Frank, who lives in Annapolis, and countless friends he made wherever he was assigned. Wake service at 7:30 p.m.